Jeff Weintraub: "The Truth of Mohammed al-Dura" – If iconic imagery makes for powerful propaganda, should we treat questions of historical truth or falsehood as irrelevant? "The Truth of Mohammed al-Dura" – If iconic imagery makes for powerful propaganda, should we treat questions of historical truth or falsehood as irrelevant? Some people have argued, explicitly or in effect, that we should indeed treat those factual questions as mere distractions from the 'deeper truth' conveyed by such images. I disagree. I think that kind of perspective is both mistaken and pernicious. I happened to be reminded of an e-mail exchange on these issues that I had with someone named Adam Rose back in 2003. The focus of that discussion was a world-famous incident during the Second Intifada in 2000, the explosion of violence that erupted after the breakdown of the Israeli-Palestinian peace talks between Ehud Barak and Yasser Arafat. A Palestinian boy, Mohammed al-Dura, was allegedly killed by sustained fire from Israeli troops at a Gaza checkpoint while he cowered for protection behind his father against a wall, eventually lying dead across his father's knees. A televised portrayal of his death, filmed by a Palestinian cameraman and broadcast by the French news service France2, inflamed public opinion across the Arab world and beyond. The image of a boy shot dead in his helpless father's arms during an Israeli confrontation with Palestinians has become the Pietà of the Arab world. [....] The name Mohammed al-Dura is barely known in the United States. Yet to a billion people in the Muslim world it is an infamous symbol of grievance against Israel and—because of this country's support for Israel—against the United States as well. As Fallows explained in his article, it was already clear in 2003 that however Mohammed al-Dura died, he was almost certainly not killed by gunfire from the Israeli checkpoint. Fallows correctly observed: "The evidence will not change Arab minds—but the episode offers an object lesson in the incendiary power of an icon." These and other factual issues remain highly contentious. But many people are not even aware that the original version of the story has been effectively debunked, and continue to assume that it is true. And for other people, pursuing these factual questions is ultimately irrelevant and even unseemly, since it can only distract attention from the truly fundamental point—the unjust and oppressive Israeli occupation of Palestinian territories, and Israel's brutal and repressive treatment of the Palestinians more generally. => Are those people right? In August 2003, via the e-mail list of Chicago Peace Now, I was alerted to a piece which made that argument explicitly: "The Truth of Mohammed al-Dura: A Response to James Fallows". An interesting perspective regarding the death of Mohammed al-Dura from Adam Rose for all of you. Thanks for passing along this piece by Adam Rose, but I cannot resist one comment. Whether or not a particular 12-year-old boy died at the hands of Israeli soldiers, the image of Mohammed al-Dura is an authentic symbol of the Israeli occupation. This points to the second and larger problem with Fallows's argument: his narrow and incomplete understanding of "truth". From Fallows's perspective, the truth that matters is who shot Mohammed al-Dura and the truth is either that he was shot by Israelis or that he was not and the Israelis were framed. And, of course, in one sense this is right and important. But there is another, even more important truth of the matter connected to its symbolic nature. And it is this symbolic truth that Fallows completely misconstrues. This is indeed an "interesting perspective," but it is hardly new or original. In fact, it's quite familiar to anyone with a passing knowledge of 20th-century politics. It's a typically Stalinist position on the question of historical and political "truth," which received its most notorious "philosophical" justification in Merleau-Ponty's appalling book Humanism and Terror, and was expressed (and applied) in more vulgar practical forms by people like Zhdanov and legions of hardworking ordinary propagandists. That is, petty and superficial questions of empirical "truth" or "falsehood" are meaningless or trivial by comparison with the "deeper" truths of the basic, overriding struggle between revolution and counter-revolution. In fact, obsessing about these supposed "factual" questions (rather than focusing on the "more important truth of the matter connected to its symbolic nature," as Rose forthrightly puts it) is not just trivial and misleading, but "objectively" reactionary or even fascist. Thus, Comrade Fallows's mistake is clear. He has fallen into the typically petty-bourgeois fallacy of what used to be called "empiricism". 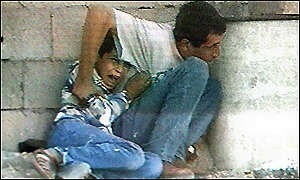 As Lukacs would have explained to poor Fallows, his thinking needs to be more "concrete"—that is, whether or not Mohammed al-Dura happened to be brutally murdered by Israeli soldiers in some narrow "factual" sense has no bearing on the "more important truth" that this image (not the image of his death, but the image of his deliberate murder by Israeli soldiers) is nevertheless an "authentic" symbol of the Israeli occupation. Since this image is "authentic" (in the sense of its larger "symbolic truth," which is obviously the "more important truth of the matter"), it's absurd to get hung up on whether or not the event in question actually happened. As Leszek Kolakowski once argued in a penetrating essay on "Totalitarianism and the Virtue of the Lie", the real innovation of Stalinist political culture in this regard was not its tendency to base politics on lies (which is, alas, a very widespread and ordinary practice with a long history), but rather its systematic effort to undermine the whole sense that there was any meaningful or legitimate distinction between "truth" and "lies" in any empirical sense. (Some non-Stalinists who grasped this innovation, such as Goebbels, praised and admired it.) This effort was embodied most powerfully in the everyday operations of totalitarian political regimes, but it also required more sophisticated justifications by people like Lukacs and Merleau-Ponty and a host of less prominent thinkers and propagandists (many of whom were not Stalinists themselves, but rather fellow-travelers, admirers, and/or imitators). I don't know whether you ever happened to see an interesting mid-1960s movie by Godard, "La Chinoise". The protagonists are a small cell of student "Maoists" in France. In one episode of the film, one of them recounts, with great admiration and enthusiasm, a news story about some Chinese students who had recently returned from Moscow to China, against the backdrop of the intensifying Sino-Soviet ideological conflict. They came off the plane with their heads wrapped in bandages–the result, they explained to waiting journalists, of the brutal beatings they had received from Soviet police (which in turn were the result and expression of the anti-revolutionary "revisionism" of the Soviet regime). The Chinese students talked about these beatings, and their injuries, at some length. Then they unwrapped the bandages, which revealed that they actually had no injuries. The French student telling the story commented that the journalists, who were startled by this, were too stupid to understand the point. They were hung up on the superficial fact that there were no injuries–and thus, presumably, no brutal beatings. As Adam Rose could have explained to them, they had entirely missed "the more important truth of the matter connected to its symbolic nature." The question of whether or not these particular beatings occurred was quite beside the point. Even if they hadn't taken place, the "more important truth" was that these beatings—and the whole imagery of the Chinese students' injuries, their bandages, etc.—nevertheless constituted "an authentic symbol" of the revisionism and counter-revolutionary brutality of the Soviet regime. => Yes, this is an "interesting perspective," which has often been used with great ingenuity and even perverse brilliance—often with good intentions and idealistic agendas, too. But I think the political history of the past century shows that it has some serious drawbacks as well. For this and other reasons, it's not a perspective that I find convincing or attractive ... and, to be perfectly honest, I tend to find its current manifestations (often presented in "post-modern" or "post-structuralist" guises) ridiculous and/or alarming ... and sometimes despicable and morally irresponsible as well. P.S. On balance, I mostly disagree with the substance of what Rose has to say in this piece, but he does bring up some valid (or partly valid, or potentially valid) points. However, they could have been developed more usefully and effectively without putting them in the overall framework of a perspective which argues that the "artistic truth" of images that vividly confirm what you already "know" (i.e., that represent and reinforce widely held prejudices) is more important than trying to figure out what actually happened. Subject: Re: [peacenowchicago] "The Truth of Mohammed al-Dura"
As the author of the piece in question, I read your comments with great interest and would like to offer the following response. 1) Whatever the possible connections with Stalinism, etc., the distinction between symbolic and historical truth has both an honorable pedigree and excellent reputation in many modern circles. With respect to the former, I tried to show, for example, that Aristotle (who I presume is still in high standing--or at least not to be simply tarred and dismissed as a Stalinist) both recognized the distinction and held symbolic (or "poetic") truth in higher esteem in historical truth. I further tried to show that this distinction is commonly found useful in considering works of art. After all, how is one to think about the "truth" of "fiction" (works that are absolutely false in the historical sense)? In cases 1 and 3, there is a historically-true representation--the event depicted "really happened". In cases 1 and 2, there is a symbolically-true representation--the event depicted "commonly/typically/always happens" and the representation is not so much of an event as of event-type and the event-type is true even if the specific event is not. As I tried to show, these distinctions are commonly (and reasonably, I think) invoked in analyses of "historically-dubious" representations. Thus, truth of Shakespeare's Macbeth is generally acknowledged not to be its historic truth (whatever connection it may have to the historic truth about the historic figure Macbeth). Rather, the truth of Shakespeare's Macbeth -- like all tragedy -- is generally considered to be its symbolic truth, the sense that it conveys that "there but for the grace of God go I (or perhaps: "I'm never going to fall into THAT trap!"). Although I didn't mention it in the essay, such distinctions are also commonly used in considerations of the Bible and other scriptures. After all, it turns out that many of the events depicted may not be historically-true, starting with Creation and running through Moses and the exodus to the resurrection of Jesus. Rather than dismiss a historically-false Bible as a fraud of no value, many people (including many non-Stalinists) consider the symbolic truth of the events depicted to be of great value. From this perspective the Moses in the Bible is seen as akin to the Macbeth in Shakespeare's play. 2) As I said in my essay none of this is to say that I (or Aristotle or anyone else) deny the importance of historical truth. Of course it matters what "really happened". On the other hand, it is also important to keep the relevance of historical truth in perspective -- just as it is important to keep the relevance of symbolic truth in perspective. In the case of Mohammed al-Dura, I think it is fair to say that most people exercised by the image/incident don't give a damn about the actual boy. And in some ways, rightly so. One individual tragedy is just one individual tragedy and the world is full of those--too full for people to empathize with all of them. Moreover, if such an event were believed/known to be unique or unusual--like a freak earthquake or a child falling down a well--it would not have resonated so strongly on all sides. Rather it is the symbolic truth--the belief / knowledge that the al-Dura image depicts an event-type--that exercises everyone (including the Israelis bent on disproving the historical truth of the incident). But because of widespread misunderstanding, almost everyone THINKS it is the historical truth that is critically important. Thus all the energy to prove or disprove the historical truth of the incident. In short, in the wider sense of world politics, etc., harsh as it may sound, the historical truth of the death of one boy is meaningless--however it occurred--to everyone on all sides of the issue. What matters is whether the depiction of al-Dura's death represents a genuine event-type--an event-type of small Palestinian boys armed with rocks at most being killed by larger Israeli boys armed with the most sophisticated weaponry available. And as I argued in the essay, there is a wealth of valid historically-true evidence (from B'Tselem and many others) that this event-type exists. Thus I think the case here is quite different from "La Chinoise" as you describe it. Although I am generally wary of invoking the Holocaust, I think the case of Anne Franks is instructive here. On some brutal level, nobody gives a damn about the terrorization and death of one girl. What make her story so compelling is that it is taken as representative of the terrorization and deaths of thousands and millions and it is the system designed and implemented to create thousands and millions of Anne Franks that is truly horrifying. Now suppose the Diary of Anne Frank had been written as a work of fiction or that it turned out her father or others tinkered with the text or even fabricated it outright, would it tell us less about the horror of that system? Would it make the diary any less a "Tomb of the Unknown Jewish Children" who died invisibly (in contrast to "Anne Frank" whose death has been made visible to us)? In short, would it have anything to do at all with whether or not there was or was not a genuine "Anne Frank event-type" and whether the Diary was an authentic symbol of that event-type? In some ways, of course, the answer is "yes". But in many, many ways, the answer is "no". And I think it is important not to throw the baby out with the bathwater. From an opposite perspective, the assassination of JFK is equally instructive. In this case there really is no symbolic truth of the matter. JFK's death does NOT represent the death of many others. People really mourn the particular, individual man and the historical facts of who killed him are critical--including whether or not shots were fired from the "grassy knoll". The revisionist analysis of Mohammed al-Dura tries to treat the event a JFK-type event, when it is really an Anne Frank-type event. 3) All of this seems to come to a head in the issue of what it takes to make "the Arabs" believe that "the Israelis/Jews" are "boy-killers". Fallows's piece suggests that "the Arabs" have no good reason for thinking this. On the contrary, he suggests they think what they want to think regardless of the evidence. Yet as I tried to show, they DO have the evidence. We all do, if we want to see it. As I have argued in my essay and here, what the Arabs "know" is NOT simply widely-held prejudice (though of course it may be reinforced by that). And it is the blithe dismissal / delegitimization of this knowledge that I object to first and foremost. P.S. If you or others are interested, a formatted copy of the essay, complete with pictures, can be downloaded and printed from www.supportsanity.org (PDF 1.2 MB). Thanks for your response to my remarks, which was serious, thoughtful, and (under the circumstances) quite temperate. I am getting at my e-mail only intermittently these days, so I just saw your message, and I can offer only a quick and incomplete counter-response. You will probably not be surprised to learn that I am not really convinced, but let me restate some of the reasons why I feel that way. To put it too briefly: I have no problem, in principle, with recognizing some kind of distinction between "historical" and "poetic" truth (for reasons that Aristotle, Kenneth Burke, and various others have suggested in various ways). (Despite my harsh words about Lukacs, I even think there is something insightful and potentially illuminating about his notion of "typical" as opposed to merely "average" or "naturalistic" representations.) The key question is how these concepts are used, or misused. In particular, artistic representations that present themselves as fiction should be judged by different standards from stories, arguments, images, and other forms of communication and representation that claim to be factually true. As for those pieces of "knowledge" that you list toward the end of your message ("If there is a de facto Israeli policy of creeping annexation" etc.) ... I think someone who "knows" those things is in fact correct, and absolutely nothing I said implies "blithe dismissal / delegitimization of this knowledge". In my opinion, that's a red herring. 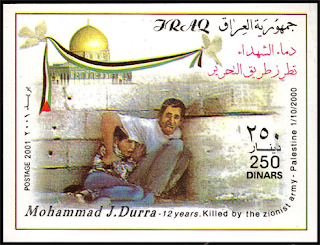 On the other hand, if someone "knows" that the Israeli occupation of the Palestinian territories is defined fundamentally and essentially by the deliberate and gratuitously sadistic murder of unarmed civilians, including the murder of helpless and completely unthreatening children "for sport"—the supposed "truth" that you say is conveyed by the image of Mohammed al-Dura's martyrdom and the way it has been interpreted—then I would submit that they're wrong ... and that reinforcing and endorsing that particular belief is not just mistaken but pernicious and destructive. In my opinion, that crosses the line between legitimate (or plausible) criticism and condemnation of Israeli policies and actions to hysterical and indiscriminate demonization of Israel and Israelis. That kind of demonization is all too common in the world today, and endorsing and reinforcing it is both and unwise and reprehensible. The results, in practice, have been disastrous for both Israelis and Palestinians. At least, that is my strong and considered opinion. In that crucial sense, "the image of Mohammed al-Dura" is not "an authentic symbol of the Israeli occupation." And if the specific story conveyed by that particular image isn't even factually accurate, then that's an additional problem.